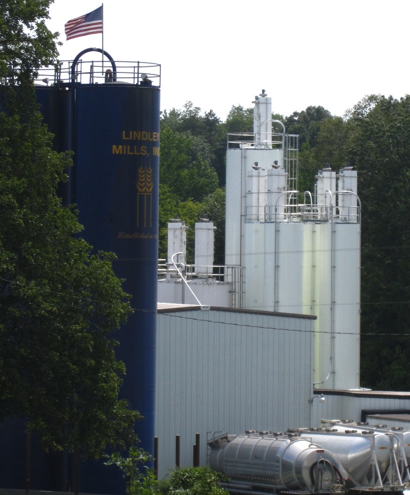 Lindley Mills, Inc. is an organic specialty flour mill and mix manufacturer based in central North Carolina. We serve bakers, processors, distributors, and restaurants locally and nationwide. Lindley Mills' mission and passion is to provide the best organic flour to our customers. Our milling approach is a blend of tradition, technology, and cutting-edge innovation. This is what sets Lindley Mills' organic flours apart from the rest, and what continues to fuel our passion for producing some of the highest-quality organic flours in the United States. The Lindley family has been milling organic flour in North Carolina for over 40 years. Our mill is located at the original site of the 1755 water mill built by Pennsylvania Quaker and settler Thomas Lindley. Today, ninth and tenth-generation Lindleys still run Lindley Mills, inspired to continue the tradition of milling real, organic, non-GMO flour—the same way our ancestors did centuries ago. Our milling capabilities include different granulations and extraction rates of wheats, rye, spelt, corn, and other grains. 40 years of organic milling have gifted us with a dedicated group of growers from all across the United States. Our ability to source the highest quality wheat from diverse geographical regions allows our organic flours to be consistent and performance-driven. Our rich background in specialty milling and product development, backed by our state-of-the-art laboratory and third party testing, enables us to provide our customers with ingredients for a competitive edge. Lindley Mills' artisan-quality flours deliver superior flavor and performance to other commercially-produced flours on the market. Our innovative process for sprouting whole grains led to the development of Super Sprout™ Sprouted Whole Grain Wheat Flour, a shelf-stable sprouted whole grain flour with enhanced nutrition, and a well-rounded taste. All of our organics are certified by Oregon Tilth and Kosher products are certified by OK Labs. We are BRC (British Retail Consortium) and Global Food Safety Certified. All certified organic grains are also non-GMO. We are supporters and members of the Bread Baker's Guild of America. North Carolina bread flour: As part of our ongoing commitment to support local farmers, we have been working with several North Carolina organic farmers to grow hard red winter wheat varieties bred to adapt to North Carolina's climate. The 100% organic hard red winter wheat variety has produced the yields that farmers look for as well as the protein quality that professional bakers desire.